Chandigarh 7thFebruary; Finally, the deadlock on the protest planned by PGI Unions was broken by PGI Administration. In an urgent meeting called by Dr. Jagat Ram Director, PGI with PGI Employees Union, PGI Medical Technologists Association and PGI Engineers Association at 4:30 pm today on the issue of Black Flag Protest on 9th February, 2019 against demolition plan of Community Centre, 40 Houses and Central Workshop, the following decisions were taken, which will be recorded and circulated tomorrow. 1. New state of art Community Centre will be built one year before the existing Community Centre will be demolished for Geriatric Centre. Further, the already planned renovation of Community Centre will be carried out within stipulated period. Union requested to make renovations within 2 months. 2. Dr. Jagat Ram, Director, PGI clarified that there is no plan to demolish 40 houses of Type 13 D, PGI, Chandigarh. 3. 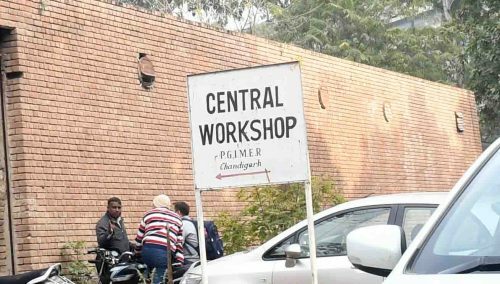 An Agenda for construction of new Central Workshop at the earmarked place in Master Plan will be placed before SFC in next meeting. In the meantime, safety aspects and interrelated work of different sections of Workshop will be looked into while making temporary shifting arrangements. In view of such positive developments, the Unions have assured to withdraw its action program of Black Flags of 9th February, 2019. The PGI Administration assured to convey written decisions by tomorrow morning, and Union will also give in writing immediately thereafter. Earlier, Ms. Nilambari Jagdale, SSP UT, Chandigarh convened a meeting with representatives of Unions at her officer in Sector 9 at 12:30 to know the details of action plan of non-faculty staff of PGI. The Unions have assured that the protest will be completely peaceful and there is no plan to come within area of Convocation and protest will be restricted to Community Centre, 40 Houses and Central Workshop areas only.